As much as I love my Smartphone I love the Cloud services. They are convenient, useful, cheap, easy to use, maintained, managed by experts, no data loss, etc. This list can go on, and one of the most favorite services is the Google Photos, that I have started using after Google offered us with Unlimited Photos storage option few months back all through the Single Application. The application is amazing that not only allows you to backup your photos, but also updates you with memories from the same day from the past few years along with the creation of “Auto Awesome” videos based on a series of photos. 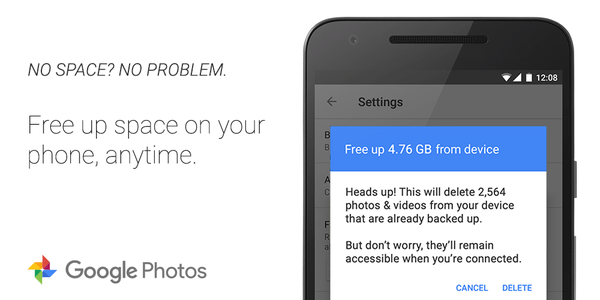 According to the latest update to the Google Photos App, you do not have to worry about space on your phone because the app would Free up space automatically. Thanks to the little setting that would upload all the photos to the cloud based on the folders you have selected to monitor, it would later delete those folders from your Camera / Gallery folder automatically. Once you have got the update for the app on your Android phone today, you will find a new button under the settings tab that offers you to “Free Up Space”. Once you Tap on this option all the local photos would be deleted if they are uploaded to the cloud. This option would easily help all the users to free up more space on their Phone, especially for those who have a very less Internal Storage, especially the consumers who have phones with 8GB or 16GB of space. Ability to delete photos from the SD-card enabled devices that was a concern for many while managing photos. Downgrading previously uploaded Original quality photos to High quality, that were counted towards the user’s storage quota. This could easily help many users save money that was earlier billed under the storage packages. With this new change, the users could head over to their Google Photos Settings on their computer and click on the “Recover Storage” option to make this switch.